BANGI, 23 May 2012- Students should think about their parents before getting involved in unhealthy activities such as street demonstrations or being part of activities that could bring about public unrest. 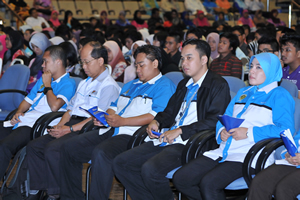 Deputy Minister of Human Resources, Senator Dato’ Maznah Mazlan, said students in universities carry with them the hopes and aspirations of their parents and families as such they should be focusing on getting the most from their university experience. Speaking at the National Higher Education Fund Corporation (PTPTN) loan advance handing over ceremony in the UKM campus here today she advised them to think of the sacrifices made by their parents to enable them to be in a university. 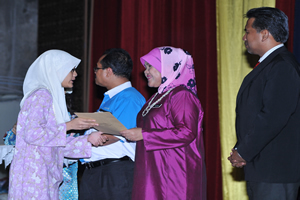 Each of the 70 first year students received a check for RM1500. PTPN is a government body which gives out loans to students pursuing their education in either private or public colleges and universities. She said students have to think hard before taking any action that could jeopardise their studies since they were now accountable for their actions. She also reminded them to spend their loan money wisely stressing that they also needed to pay back their loans once they graduated and are working. The Deputy Minister also advised students to mingle and interact with other students from different cultural and ethnic backgrounds so as to hone their interpersonal skills while also enriching their experiences. By interacting with other ethnic groups, they will appreciate their differences and come to accept problems faced by others instead of just tolerating their differences. It will be a waste if students in institutions of higher learning only concentrate on academic achievements but neglect to develop their interpersonal skills and understanding of others. Present at the ceremony was Deputy Vice Chancellor (Students and Alumni Affairs), Prof Ir Dr Othman A. Karim; Director of Biro Tata Negara Selangor, Mohd Zamri Kahar and a representative of PTPTN, Encik Rusdi Ismail and parents.